But that does not stop us. We just take sturdy shoes, heavy clothing, gloves, water and a nice long rope. We have explored some of the more accessible areas of the property recently, so we decided to get a little more adventurous today. We headed west from the house and then north into the deep valley visible from the deck. The valley is formed and fed by 3 gullys that run down from the mountain, and drops almost 200 metres from the road level. Heading down to the west of the house it is open grassland forest and an easy walk. Then we headed downhill and to the north. The image at the top of the page gives you some idea of the steepness of the property. But to get a real view of the speed at which the land drops away you really need some perspective. This next image shows Shionagh on the slope as we headed north(and down!). That gives you some idea of how fast it drops away. We continued down to the north and headed to the western boundary, which is marked by a fence between us and the neighbouring property to the west. 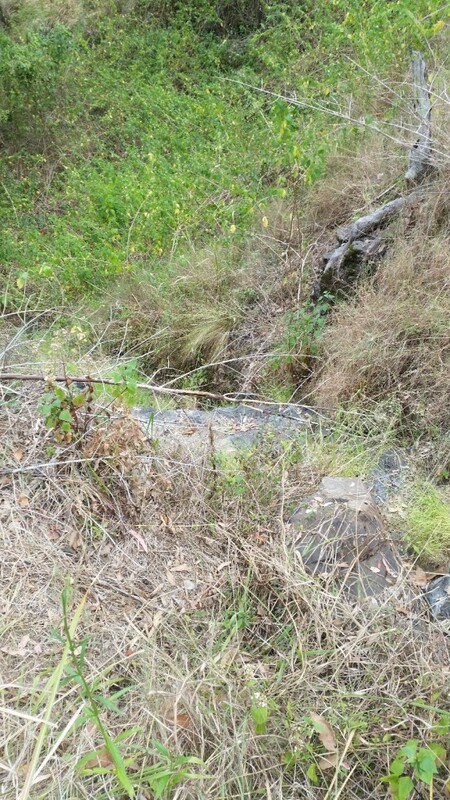 As we reached the bottom of the valley and continued north we crossed a number of ephemeral creeks. The three main gullys flow into two as they reach the bottom of the valley. At each creek we discovered more intermittent waterfalls. The picture above does not do justice to the actual waterfall. It drops about 3-5 metres from where we were standing. As with some of the other waterfalls, this one has a rock base where the earth has been cleared away by rain and water flow and exposed the ‘bedrock’. Waterfall #7 drops about 2-3 metres. As we had discovered previously, our way was blocked by thick lantana in places and we had to adjust course. 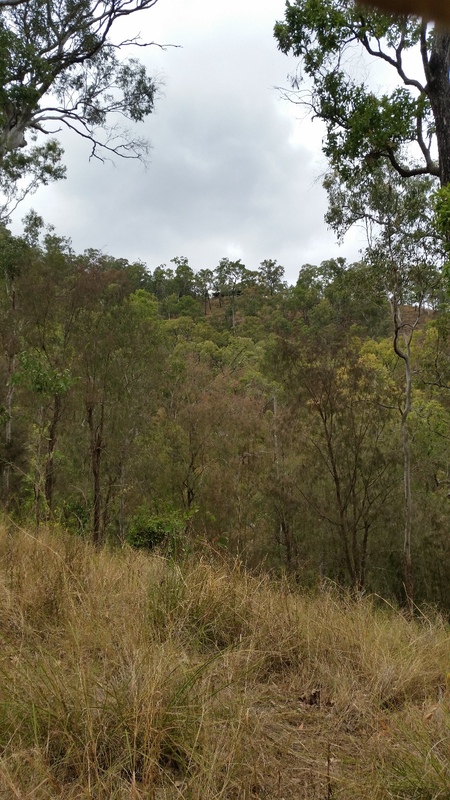 So after getting as far north as we could, we turned east and headed up hill towards Lamington National Park Rd. The going was relatively easy and the forest opened up again giving us a clear view up from the valley floor in places. The next image show the house from the bottom of the north valley. Can you see it ? It’s a long way up…. Approximately 200 metres up. We left a pile of branches and logs at this clear spot, so we could see the clearing from the house later. And we could. From here we continued east and up…. 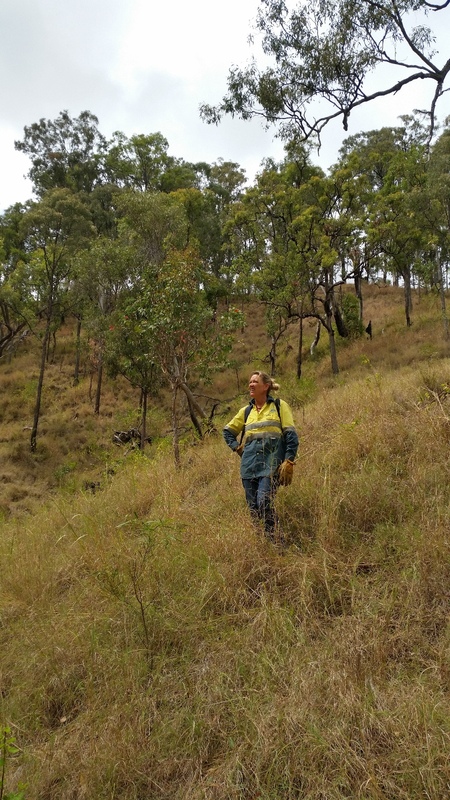 through open forest, past grass trees, blue flax lillys and our usual trees – She-oaks, Queensland Bluegums, Narrow-leaved Ironbarks, Bloodwoods and Acacias. As we continued up, we discovered we were about a kilometre along the road from the house when we made it to the road. 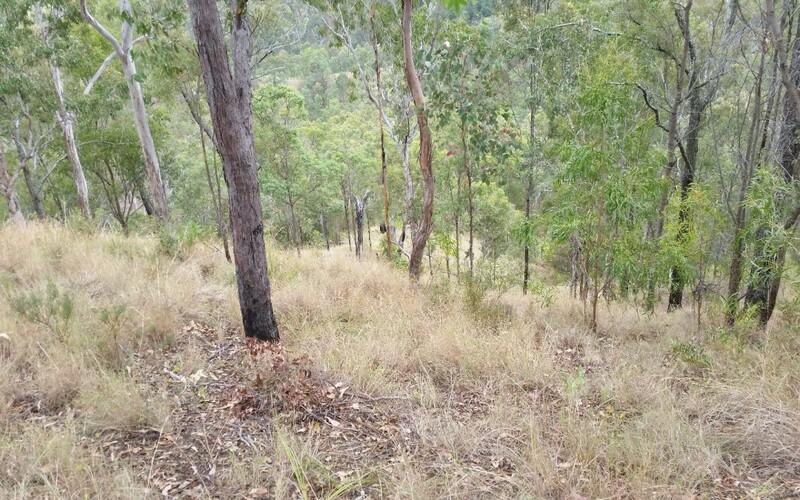 In fact we were at The Cut – an open pull-out on Lamington National Park Rd. We would never have planned to come up that way as it is incredibly steep, but travelling up was not so hard… A little bit of hand-and-knees scrambling, but not too difficult. 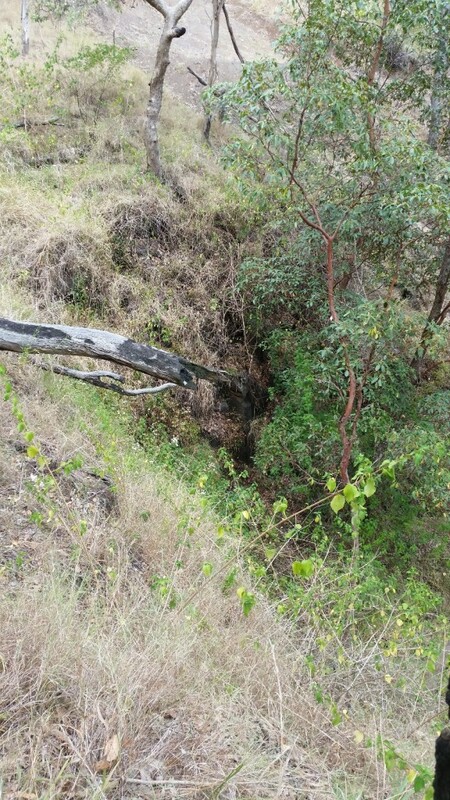 Our only other concern was what drivers might think… seeing to dirty and ashy weirdos climbing up a cliff out of the bush in the middle of nowhere. Luckily… no one was around.